I seem to have inadvertently got a bit of a “pink” theme going at the moment, and these are the second pair of pink toes I’ve found for you this week already! In fairness, these only have a touch of pink on the toe and heel, but the overall effect is still very “Elle Woods”, don’t you think? 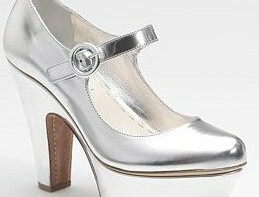 Not that this is a bad thing, of course: in fact, my brain just started to concoct an Elle Woods Halloween costume which would give me a legitimate reason to buy these shoes. I’m thinking little tailored jacket (pink, natch), pencil skirt, little fluffy dog… Of course, like my “Louboutin witch” idea last week, that idea probably won’t fly with Shoeperman, given that the shoes are £265, but at least I already have the little fluffy dog, no? You don’t have to dress like an extra from Legally Blonde to wear these, though: they’d actually be pretty easy to tone down, and are such a classic shape that they should prove to be very versatile. 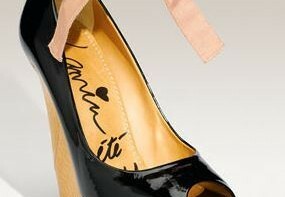 If you want to see for yourself, they’re by Red Valentino, and you can click here to buy them from Saks. Ooh I love these! Another pair to add to my wish list… I’d better start saving! I love them! I want them! But as they are pricey, I can’t have them… anyway, really really in love with these lovely shoes!!!! Oh my word. Have you ever seen anything so beautiful!? I’m in love. What a gorgeous pair of shoes.